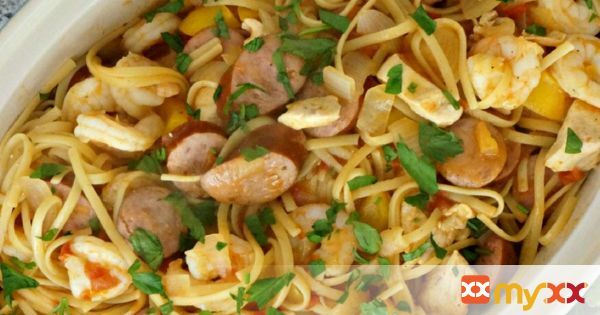 One-Pot Jambalaya~ with smoked sausage and shrimp. 1. In a large stockpot heat oil over medium heat. Add chicken and cook until white. Add remaining ingredients (except shrimp and cilantro). 2. Bring to a boil stirring often, adding additional stock if necessary. Cook on a simmer for 20-25 minutes or until noodles are tender. If adding shrimp do so about 15 minutes after pasta. 3. Garnish with cilantro and serve.